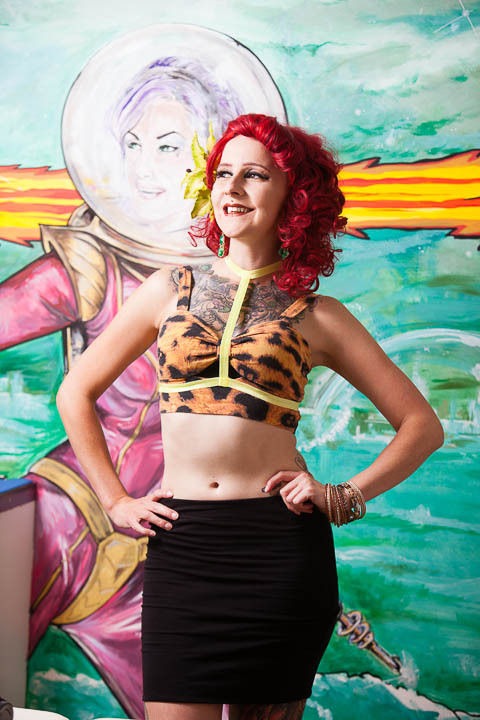 Here’s a quick shoot with burlesque performer and professional body-piercer, Lou-Leigh Blue. The shoot took place at her studio at Purple Rose Tattoo, Bristol where she’s really gone to town on the cool and quirky decor. Lou-Leigh modelled harnesses by Blu83, a small fashion label run by fellow burlesque performer, Daisy Cutter. Daisy Cutter’s has been performing burlesque since 2006 and been a costume, clothing and accessory maker since gaining her first qualifications in 2001. She was the winner of best designer 2010 at Leeds retail awards. The lighting use was as simple as it gets: A simple Canon 580 flash with a large umbrella on a light stand give a smooth, easy light in the small studio space.